Light, airy, and filled with country charm, the Vedette 5-drawer Storage Tower from Safavieh is a must have for those looking for a modern yet functional storage piece. Just under 4-feet tall, this unit is perfect for compact apartments and spacious family rooms alike. 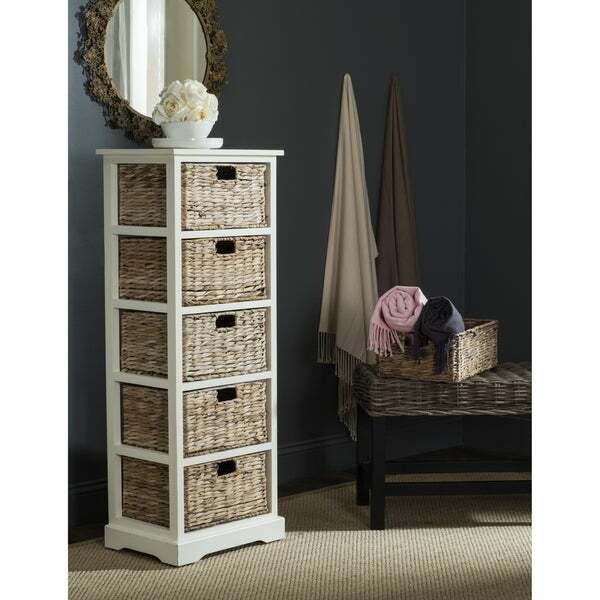 Crafted of pinewood with a distressed white finish, the simple frame has rattan weave pull-out drawers for easy organizing. Place in an entryway to declutter shoes, and other accessories, or place in a bathroom to organize toiletries and towels. Add this refined yet relaxed piece into your home to love for years to come. Wow! Love this piece. It fits perfectly in the space we needed it and it's very attractive and seems well built. Comes assembled (!!) and delivery was only four days after I placed the order. Only reason I'm knocking off 1 star is because the baskets don't consistently slide in/out very well and seem to catch a bit and also because the color is a little less bright white than the picture makes it look. I placed it in a room with other white furniture and this piece looks slightly more yellowish than the other pieces, but not too noticeable that I'll return it. I like the unit but the color should be described as Cream as is not white or antique white. I have white trim in my guest room and it does not match at all. I love this tower! The height is perfect for the space in my kitchen. The baskets are sturdy and hold quite a bit. Only thing is the color isn’t exactly what I expected but it blends. I love this! I received it and put it next to my entertainment center. Matches exactly in color. I ordered another. Really great storage room. Ive had it for a few months now. I just LOVE LOVE LOVE IT! It's perfect! It came in ONE PIECE! No assembly required. Light enough for me to carry it upstairs by myself. Love these Saveigh products. Love the look. Love the storage. Not too heavy you can move them around house if needed. Great for staging and beach coastal looks. Wicker was unwoven from basket drawers when it arrived, so its impossible to pull them in/out without it catching on the sides. Slightly rough finish. White is distressed and more of an almond.Drawers don't slight very easily in or out. Looks great in my room and does not need to be built. It’s a very nice addition to our baby room. It will fit in several different locations. Bathroom for odds and ends. Living room for books. Bedroom for socks, etc.....So many uses for this beautiful cabinet! "what are the measurements of this unit? (and ideally each basket or shelf height too)"
This storage tower measures approximately 17.3 inches W x 13.4 inches D x 46.1 inches H. The baskets measure approximately 12.2 inches W x 11.2 inches D x 4.5 inches H.